Uni-tiles by Al Maha Ceramics ... made using latest digital print technology. 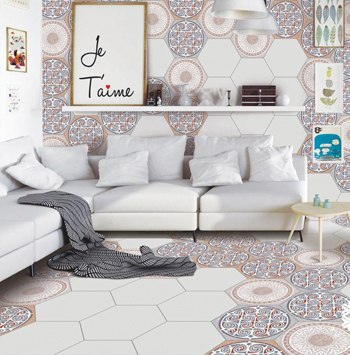 Al Maha Ceramics, a leading ceramic tile manufacturer in Oman, has launched a new range of tiles made in a hexagon shape using contemporary digital printing technology. The new ‘Uni-tiles’ come in 30x30cm with 8-mm thickness and can be uniformly laid both on wall and floors in symmetry, says the company. “The company is first in the GCC region to launch the hexagon-shaped ceramic tiles. These wall and floor tiles will open a new chapter in the concept of laying tiles, unleashing the creativity of architects and designers,” remarks Rajeev Singh, senior general manager at Al Maha Ceramics. Al Maha Ceramics has been a pioneer in Oman and the GCC in launching several products in the digital printed digiplus range including the large format floor tile in 60x60 cm size and wall tiles in 30x60 cm size and hexagon-shaped 12-mm-thickness exterior tiles. The company says a very attractive range of tiles with modern Italian designs has been developed for the discerning customers of the GCC region. The new Uni-tiles would be available at selected Al Maha dealer showrooms. With this initiative, Al Maha will join the league of the few ceramic tile manufacturers worldwide that produce this size and pattern of tiles. The London Crackle Bed ... stylishly-crafted. 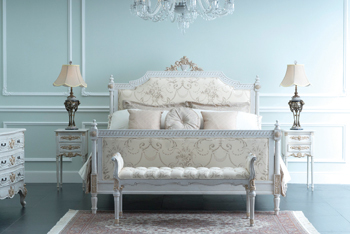 Leading UAE luxury furniture and home décor brand 2XL has unveiled its latest London Crackle Bed, which, the company dubs as ‘the epitome of style, functionality, and comfort’. The stylishly-crafted London Crackle Bed is priced at Dh7,119 ($1,937) with bedside side table at Dh1,298, chest of drawers at Dh3,335 and bedroom bench at Dh2,222. The retailer currently has nine showrooms across Abu Dhabi, Dubai, Sharjah, Fujairah and Al Ain. The 2XL product range includes exclusive bedroom, living and dining room furniture as well as exquisitely crafted décor items, plush rugs and wall art, bath linen, eye-catching tableware, and functional kitchenware range. 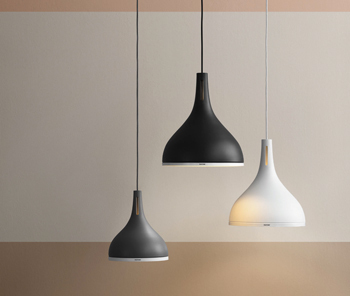 Castor pendant lamp ... from the Pantone collection. PANTONE, a leading global colour authority, has launched its first-ever lighting collection Pantone Light –Coll One, in partnership with e3light, a European market leader in lighting solutions. The colourful six-piece Scandinavian-inspired collection features a clean-lined balance, with innovative combinations of contrasting materials, colours and textures. The collection packs sophisticated technology into creative solutions, boasting distinctive style through playful colour and a modest sensibility. The collection includes Deneb pendant, Castor pendant lamp, Capella table lamp, Antares floor lamp, and Mintaka and Sargas lampshades.